Iodine-131 (I-131) is often used in thyroid diagnostics and therapy. External and internal exposure to radioiodine can lead to molecular and cellular damage in peripheral blood lymphocytes. The aim of this study was to explore the influence of low and high doses of I-131 on susceptibility to ionizing radiation. Study groups consisted of 30 individuals free of thyroid diseases, 41 patients exposed diagnostically to low doses of I-131, and 37 hyperthyroidism patients exposed therapeutically to high doses. The standardized DNA repair competence assay was used to test the efficacy of the fast DNA repair process in G0 cells. Cytogenetic preparations were made in fresh blood samples before and after challenging cells in vitro with X-ray dose. The frequency of sister chromatid exchanges (SCE) and percentage of cells with significantly elevated numbers of SCE were used as cytogenetic biomarkers associated to homologous recombination and compared to reported earlier cytogenetic biomarkers of cancer risk. Strong individual variation in the biomarkers is observed in all investigated groups before and after challenging. Nevertheless, the efficiency of post challenging fast repair is significantly high in the patients exposed to diagnostic I-131 doses than in unexposed control group and linked to decreased cytogenetic damage. However, 5 weeks after administration of therapeutic doses, significant increases of unrepaired post challenging DNA and cytogenetic damages were observed indicating a health risk. Results also suggest that the appearance of cancers in immediate families might influence DNA repair differently in patients exposed to low than to high doses. The challenge for molecular epidemiological and environmental studies is to advance and improve the process for assessing the risk to human health from exposure to ionizing radiation (IR). Exposure to IR can result from occupation, medical procedures, and industrial accidents. It is well recognized that IR causes various biological effects within days, weeks, or years. While the use of radiation around the world offers a wide range of benefits in medicine, energy production, industry, and research, safety precautions are essential to understand and moderate unnecessary exposure of persons. Despite the fact that the precautions to be taken are clearly established, even if infrequently, accidental exposures from various radiation sources including nuclear power plants might still occur, in which release of iodine-131 (I-131) among emission of various radioactive isotopes might be one of the first sign of misfortune. In human body, iodine preferentially accumulates in thyroid. This property is, therefore, used in nuclear diagnostic and therapeutic medicine to improve health conditions by early disease detection, slowing an overactive thyroid or killing cancer cells. The ease of administration, low cost of I-131, and half-life of just over 8 days make it an attractive and effective method for a diagnostic procedure and therapy of the hyperthyroidism or cancer. This is a beta-emitting radionuclide with a maximum energy of 0.61 MeV, an average energy of 0.192 MeV with a range in tissue of 0.8 mm. However, despite these favorable characteristics, external or internal exposures to radioiodine can lead to molecular and cellular damage not only in thyroid cells but also in other tissues, including peripheral blood lymphocytes. It can increase the occupational risk as well. That is why particular attention needs to be paid to the patients' quality of life after the treatment, as well as to the general public in case of nuclear emergency. For that reason, a reliable estimate and prediction of normal tissue/cell response to IR and consequent health risk from exposure would be very useful in occupational radiation protection, radiotherapy, and population risk estimation. In addition, radiation sensitivity is one of the main factors that differentiate individuals in terms of the effectiveness of therapeutic procedures or its side effects. This depends on how well the damage incurred on the cells is repaired. Individual variation in response to IR is expected as genetic background, metabolic rate, and DNA repair capacity of individuals influence such responses. Therefore, the main aim of this study was to investigate the influence of IR exposure to low doses resulting from diagnostic usage of I-131 and to high doses from therapeutic administration of this radionuclide. DNA damage detected at the cellular and molecular levels in human blood lymphocytes was assessed for this purpose. The other aim was to investigate, by challenging cells in vitro with high X-rays dose, if and how, the follow-up exposure to low or high doses of iodine can influence vulnerability to other genotoxic exposures and/or alter cellular DNA repair efficiency that might increase or decrease health risk. The study group consisted of 41 subjects diagnostically exposed to low doses of the I-131 (in the range 1.85–4.45 MBq, AAv = 2.96 ± 0.82 MBq) and 37 patients who had returned to polyclinic for hyperthyroidism treatment with I-131 (in the range 300–650 MBq, AAv = 497.3 ± 88.1 MBq). All consenting volunteers provided blood samples and responded to the questionnaire describing their lifestyles, hobbies, health conditions, and occupational history. Blood samples from thyroid patients were collected twice: Just before application of the therapeutic dose of the I-131 and 5 weeks later. The control group (CG) consisted of 30 unexposed volunteers, free of thyroid diseases and considering themselves as healthy. [Table 1] shows brief characteristics of the investigated groups. At the cellular level, cytogenetic biomarkers, such as frequency of sister chromatid exchanges (SCEs) and percentage of cells with significantly elevated numbers of SCE per cell (high-frequency cells [HFCs]), were monitored in the second mitotic division.,, HFCs were evaluated as the percentage of cells displaying higher than seven number of SCE per cell. All data were statistically analyzed using Statistical Package for Social Sciences (SPSS, IBM Corporation, USA). Significant levels correspond to two-sided tests based on variance analysis from ANOVA program. Results were considered statistically significant for P < 0.05. [Table 2] presents molecular and cytogenetic data for investigated groups; CG, exposed to I-131; diagnostic group (DG) to low and therapeutic group (TG) to high doses. For the DG group, a significant decrease from the CG was observed in the percentage of unrepaired DNA damage during postirradiation incubation (RDT-DNA), as well as in the average number of SCE per cell and HFC detected in cells not irradiated with challenging dose. The significant decrease from values obtained for control was also observed in values of SCE(Gy) and HFC(Gy) detected in cells irradiated in vitro with challenging dose. No significant difference between the control and DG (I-131) groups was observed in defrosted cells (T_DNA0) and cells' radiosensitivity (SXT-DNA), as well as in maximal values of SCE detected in cells without and after IR challenging in vitro (SCEmax, SCEmax (Gy)). In the samples collected 5 weeks after administration of I-131 therapeutic treatment, significantly (P < 0.03) higher level of DNA damage was detected in vivo (T-DNA0= 7.2 ± 1.4) in comparison to the level detected before therapy (T-DNA0= 6.15 ± 1.6) and to the average level detected for control (T-DNA0 = 6.5 ± 1.8). Significantly higher level of residual damage (RD) was detected 5 weeks after the therapy (RDT-DNA = 35.7 ± 18.6) than that seen before therapy (RDT-DNA = 22.8 ± 11.4, P < 0.002). However, this level reached the baseline of CG. Although the cells were collected 5 weeks after administration of therapeutic radioiodine in response to challenging irradiation, SCE(Gy) and HFC(Gy) still show a slight decrease when compared to control, though showed a significant increase from the level observed after the diagnostic dose. No significant difference was observed between values describing radiosensitivity (SXT_DNA) before and after therapy. 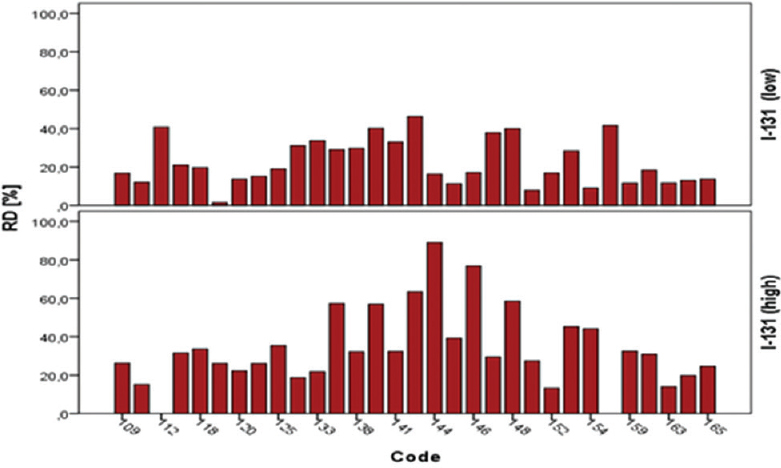 On average, also, no difference was observed between maximal SCE values detected for all investigated groups. As shown in [Table 2], mean values for all reported biological effects in cells without challenging irradiation and after challenging in vitro were significantly different after diagnostic treatment compared to CG. However, it appears that variability between individuals seems to be rather high as reflected by the large standard deviation values. For comparison, [Table 2] presents cytogenetic biomarkers of health risk from cancer, i.e., MN in binucleated cells frequencies (MNBNF) and CSA frequencies, evaluated for the same subjects in investigated groups which were already reported before.,,, Frequency of MN in the CG was significantly higher than that observed in the diagnosed group, and it was not significantly different from the mean value observed 5 weeks after administration of the therapeutic I-131. On the contrary, the average level of CSA that was detected in lymphocytes of patients 5 weeks after exposure to a therapeutic dose of I-131 was significantly higher in comparison to that observed in the control, as well as in the group exposed to the diagnostic, low I-131 doses. [Figure 1] shows the comparison of variabilities between values of residual DNA damage (RDT-DNA) percentage of DNA damage, induced by challenging dose, which was unrepaired during postirradiation incubation (RD). Variability between individual's values detected in cells of subjects exposed to a diagnostic (low) dose of I-131 is shown in the upper panel of [Figure 1]. At the bottom panel of [Figure 1], values of the RDT-DNA evaluated for cells of the same subjects 5 weeks after therapeutic (high) exposure to I-131 are presented. Variability between amounts of unrepaired radiation-induced DNA damage is very high and different for subjects exposed to low (diagnostic) dosage from that observed after high dose [Figure 1]. These results demonstrate that cells of some subjects express dramatically different DNA repair efficiency after high I-131 dose from that observed after low I-131 dose. Similar to strong variability between individual molecular responses to the challenging dose of radiation and resistance to repair radiation-induced DNA damage, which are observed in [Figure 1], a strong variability is observed in responses at cellular levels [Figure 2]. There are shown cytogenetic biomarkers (SCE, HFC) associated with DNA repair based on HR, which is considered to be the most conservative and error-free mechanism of DNA repair. [Figure 2] shows the comparison of variability between individual results obtained for biomarkers evaluated after challenging with X-rays (SCEGy left panel, HFCGy right panel). Histograms at the upper panel show levels of biomarkers detected in lymphocytes from subjects belonging to group diagnostically exposed to low doses of I-131 (DG(I-131)), and histograms at the lower panel show data for subjects from a group of exposed to high (therapeutic) I-131 doses (TG(I-131)). It can be seen that at both the dose regions, individual variations among the biomarkers were rather high (particularly in case of HFCGy). For some individuals, responses to challenging IR dose after diagnostic dose are much different than that observed in their cells 5 weeks after high therapeutic exposure. [Figure 4] demonstrates the comparison of dispersion between MN frequencies observed in all 3 investigated groups of subjects. Data there are labeled with different color distinguishing results of interview with question about occurrence of cancer incidences in immediate families (CiF). For persons who reported cancers in the family (CiF-positive, answer-yes) circles are blue. It seems that in the CG, results for those persons are almost equally scattered all over the mid value of MN frequency. On the other hand, in the thyroid diseases patients group, results of MN frequencies detected in lymphocytes of patients reported no cancers in family, are mostly above the best fit line for total iodine dose exposure relationship, expressing higher than expected value of MNBNF. [Figure 5] shows results of average values RD, HFC, and HFC(Gy) obtained after stratification groups to subgroup of subjects who answered the question about cancer incidence in immediate families in yes or no. Left panel of [Figure 5] shows results obtained for both subgroups (CiF–yes, CiF no) of subjects exposed to low I-131 (diagnostic) which are presented against results evaluated 5 weeks after administration of high I-131 (therapeutic) dose. To avoid variability caused by differences in individual I-131 doses, results were normalized to average dose for those groups. [Figure 5]a shows mean values of biomarkers before normalization and [Figure 5]b shows results after normalization to average diagnostic and therapeutic I-131 dose. As seen from comparison of [Figure 5]a and [Figure 5]b, normalization to average I-131 dose had not changed differences observed between two compared diagnostic and TG. Results presented in [Figure 5] show that influence of predisposition to cancer reported for immediate family is not as clearly visible after low (diagnostic) dose of I-131 as seen in results obtained 5 weeks after a therapeutic dose. Results presented in [Figure 5] also confirm that genetic predisposition, which might be associated to reported incidence of cancers in immediate families, may affect response and levels of biomarkers observed after high doses. What is more, there was a linear dose-response in molecular biomarker (RDT-DNA) in patients with no cancer reports in immediate families. This might suggest that some individuals, particularly those with reported cancers in the family, and possible genetic predisposition, may have a less efficient mechanism of slow DNA repair. This highlights the fact that DNA repair system may be responsible for differential radiosensitivity in all responses to low and high doses of radiation. However, because of much smaller size of the subgroups, differences between average levels of investigated biomarkers obtained for subgroups with different CiF factors are statistically not significant. Therefore, increasing the sample size in subgroups and deepening that idea of the crucial role of DNA repair mechanisms are necessary. It is known that exposure to radioactive iodine can increase the risk of cancer. The use of I-131 for diagnostic and medical treatment results in unquestionable benefit for patients from the improvement of health state. Nevertheless, finding a less expensive biomarker or blend of short-term assays, which give faster and still accurate prediction of individual radiosensitivity and efficiency of any therapeutic treatment, is very important. Such markers might help administrate therapeutic doses even more precisely and reduce the risk of late effects. What is more, these markers might be also crucial in estimating the risk of cancer in groups potentially exposed to the occupational hazard. Single-cell gel electrophoresis (comet assay) is a well-established test, frequently used to test the genotoxicity of chemical and physical agents, both in vivo and in vitro. Both induction of mutations and DNA misrepair may be considered as an early indicator of increased cancer risk. Earlier studies ,,, have used and recommended comet assay to determine the risk of exposure to low doses of IR. Our results are in agreement with those and with findings by Sönmez et al. who had investigated the genotoxic risk associated with diagnostic exposure to low doses of I-131 using SCE analysis. Although SCE values at 24 h after I-131 administration did not show a significant increment (P < 0.05), there was a significant increase at 72 h after treatment (P < 0.05). Therefore, our findings fall in with results reported by Sönmez et al. Statistically significant increase in the SCE and HFC in lymphocytes was observed by Bozkurt et al. in individuals occupationally exposed to I-131; those results are not that different from ours although we have studied the effects from acute exposure to I-131. In general, studies of health risk associated to medical application of I-131 much more frequently use assays that are epidemiologically proven as biomarkers of cancer risk, such as MN frequency and CSA. Gutiérrez et al., did not find any significant difference in the MN frequency in 22 women who had received a therapeutic dose of I-131. However, in a subsequent study, Gutiérrez et al. reported that hyperthyroidism patients who received the therapeutic I-131 sodium iodide, through oral administration, exhibited higher frequencies of MN and CBMN cells in a subgroup of patients who received more than 500 MBq. Gil et al. reported the absence of chromosome instability in the peripheral blood lymphocytes of individuals with no familial thyroid carcinomas. However, studies by Monteiro et al. clearly confirmed the persistence of cytogenetic damage until 6 months after iodine administration, namely, as chromosomal aberrations and MN induced in lymphocytes of thyroid cancer patients after therapeutic doses of I-131. Ballardin et al. confirmed that MN assay is sensitive enough to indicate any possible genetic damage induced by therapeutic exposure to I-131; however, MN measured 1 year after exposure, and their role as a reliable biomarker predicting cancer risk is eliminated. In their studies, declining MN frequency had reached the baseline frequency even earlier, after 180 days. Popova et al. also confirmed genotoxic activity of therapeutic I-131, estimated from a significant increase in the frequency of MN observed 1 month after thyroid cancer therapy. Ballardin et al. reported later that confounding factors such as oxidative stress or vitamin levels may influence the induction of MN following exposure to I-131. Kinashi et al. had compared MN frequency detected in lymphocytes of 14 thyroid cancer patients who were administered 3.3–5.6 GBq of I-131; with results from patients after boron neutron capture therapy (BNCT), they reported that it was 3 times higher than that observed after BNCT. Results of review by Iarmarcovai et al. and meta-analysis of MN frequency in lymphocytes of cancer patients validated the existing evidence and a role of MN in various steps of carcinogenesis. Three-step meta-analysis had shown a significant increase of MN frequency in untreated cancer patients and thyroid cancer patients after radioiodine treatment, and a negative trend of meta-FRs when plotted versus the dose used to study patients' radiosensitivity. Results by Sundaram et al. and Vrndic et al., have also shown that MN frequency, as a biomarker of cancer risk, might not be reliable if it was investigated in lymphocytes which were affected by intensive cells proliferation as well as an apoptosis processes. Other reports ,, confirmed a statistically significant increase of cytogenetic damage detected after therapy although authors stressed strong influence of time between exposure and biomarkers monitoring. Our report is in agreement with all above observations. Nascimento et al. evaluated the biokinetics of radioiodine in adult cancer patients from the 1st hour following radioiodine administration until minimum detection limits were reached. Authors reported the exponential type of retention kinetics with two biological half-lives, 0.81 day from day 1 to day 6 after the I-131 intake, with increasing appearance later in urine, and after 2 weeks, the retention of iodine in the body followed an exponential decrease, with a half-life of about 15 days. Other findings , explained the discrepancy between some authors, who studied cytogenetic damage at different time after iodine administrations. Many other studies ,, showed that specialized pretreatment of differentiated thyroid carcinoma might result in even in lower genotoxic risk from I-131 exposure than this which is expected from hyperthyroidism or hypothyroidism. To wind up, therapy, at all doses of I-131, induces genotoxic damage associated to health risk which is only transiently indicated by chromosomal abnormalities in the form of increased CA and MN in lymphocytes of exposed patients. However, only a few studies are available demonstrating how exposure to I-131, very low (diagnostic), in comparison to high (therapeutic) are affecting DNA repair processes which are crucial to induce cytogenetic damage. Our results might be useful in explaining this gap. Recent results show that level of detected cytogenetic damage and reliability of the estimated biomarkers of secondary cancer risk might be affected not only by the range of administrated dose and length of time between iodine administration and sampling but also mainly by alteration of DNA repair process due to genetic predisposition, occupational hazard, and lifestyle of the exposed individuals. The extension and deepening of studies of those samples (i.e., of the polymorphisms of genes involved in the DNA damage-repair following irradiation) can help find the combination of fast and not expensive biomarkers, which might give a more accurate prediction of individual radiosensitivity which could be important for clinical applications. More studies might also help fulfill gaps in this knowledge and understanding of the mechanism behind observed variability in responses to radiation. Available assistances in various parts of projects; samplings, coding, scoring from; Z. Drąg, J. Miszczyk, J. Pawlus, A. Panek are greatly appreciated. Masson O, Baeza A, Bieringer J, Brudecki K, Bucci S, Cappai M, et al. Tracking of airborne radionuclides from the damaged Fukushima Dai-ichi nuclear reactors by European networks. Environ Sci Technol 2011;45:7670-7. Gąsiorkiewicz J, Krzysiek M, Miszczyk J, Panek A, Pawlus J, Stępień A, et al. Studies on a response to the challenging dose of X-rays in lymphocytes of patients undergoing diagnosis and treatment with Iodine-131. In: Cebulska-Wasilewska A, Osipov AN, Darroudi F, editors. Rapid Diagnosis in Populations at Risk from Radiation and Chemicals. Vol. 73. Amsterdam, The Netherlands: IOS Press, NATO Science for Peace & Security Series E: Human and Societal Dynamics; 2010. p. 221-31. Visvardis EE, Tassiou AM, Piperakis SM. Study of DNA damage induction and repair capacity of fresh and cryopreserved lymphocytes exposed to H2O2 and g-irradiation with the alkaline comet assay. Mutat Res 1997;383:71-80. IAEA. Cytogenetic Analysis for Radiation Dose Assessment, Technical Reports Series No. 405. Vienna: IAEA; 2001. Wolff S. Biological dosimetry with cytogenetic endpoints. In: Gledhill BL, Mauro F, editors. New Horizons in Biological Dosimetry. New York, USA: Wiley-Liss; 1991. p. 351-62. Tice RR, Agurell E, Anderson D, Burlinson B, Hartmann A, Kobayashi H, et al. Single cell gel/comet assay: Guidelines for in vitro and in vivo genetic toxicology testing. Environ Mol Mutagen 2000;35:206-21. Cebulska-Wasilewska A. Response to challenging dose of X-rays as a predictive assay for molecular epidemiology. Mutat Res 2003;544:289-97. Cebulska-Wasilewska A, Miszczyk J, Drag Z, Kim JK. Health risk impact due to exposure to I-131 with low and high doses evaluated with micronucleus assay. J Korean Radiat Ind 2011;5:331-5. Miszczyk J, Drąg Z, Stępień A, Cebulska-Wasilewska A. Application of the Micronucleus (MN) Assay to Estimate Health Risk due to Exposure at Low and High Doses of I-131; 2012. p. 154-6. Cebulska-Wasilewska A, Rachtan J, Rudek Z, Drag Z. Cytogenetic damage detected in lymphocytes of donors from Małopolska region in Poland and cancer incidence in the follow-up studies. In: Donnelly KC, Cizmas LH, Editors. Environmental Health in Central and Eastern Europe. The Netherlands: Springer; 2006. p. 53-64. Bonassi S, Znaor A, Ceppi M, Lando C, Chang WP, Holland N, et al. An increased micronucleus frequency in peripheral blood lymphocytes predicts the risk of cancer in humans. Carcinogenesis 2007;28:625-31. Bonassi S, Norppa H, Ceppi M, Strömberg U, Vermeulen R, Znaor A, et al. Chromosomal aberration frequency in lymphocytes predicts the risk of cancer: Results from a pooled cohort study of 22 358 subjects in 11 countries. Carcinogenesis 2008;29:1178-83. Wojewódzka M, Kruszewski M, Iwaneñko T, Collins AR, Szumiel I. Application of the comet assay for monitoring DNA damage in workers exposed to chronic low-dose irradiation. I. Strand breakage. Mutat Res 1998;416:21-35. Speit G, Rothfuss A. The comet assay: A sensitive genotoxicity test for the detection of DNA damage and repair. Methods Mol Biol 2012;920:79-90. Krajewska G, Pachocki KA. Assessment of exposure of workers to ionizing radiation from radioiodine and technetium in nuclear medicine departmental facilities. Med Pr 2013;64:625-30. Dobrzynska MM, Pachocki KA, Gajowik A, Radzikowska J, Sackiewicz A. The effect occupational exposure to ionizing radiation on the DNA damage in peripheral blood leukocytes of nuclear medicine personnel. J Occup Health 2014;56:379-86. Sönmez S, Ikbal M, Yíldírím M, Gepdiremen A, Oztas S. Sister chromatid exchange analysis in patients exposed to low dose of iodine-131 for thyroid scintigraphy. Mutat Res 1997;393:259-62. Bozkurt G, Yuksel M, Karabogaz G, Sut N, Savran FO, Palanduz S, et al. Sister chromatid exchanges in lymphocytes of nuclear medicine physicians. Mutat Res 2003;535:205-13. Gutierrez S, Carbonell E, Galofre P, Creus A, Marcos R. Micronuclei induction by 131I exposure: Study in hyperthyroidism patients. Mutat Res 1997;373:39–45. Gutiérrez S, Carbonell E, Galofré P, Creus A, Marcos R. Low sensitivity of the sister chromatid exchange assay to detect the genotoxic effects of radioiodine therapy. Mutagenesis 1999;14:221-6. Gil OM, Oliveira NG, Rodrigues AS, Laires A, Ferreira TC, Limbert E, et al. No evidence of increased chromosomal aberrations and micronuclei in lymphocytes from nonfamilial thyroid cancer patients prior to radiotherapy. Cancer Genet Cytogenet 2000;123:55-60. Monteiro Gil O, Oliveira NG, Rodrigues AS, Laires A, Ferreira TC, Limbert E, et al. Cytogenetic alterations and oxidative stress in thyroid cancer patients after iodine-131 therapy. Mutagenesis 2000;15:69-75. Ballardin M, Gemignani F, Bodei L, Mariani G, Ferdeghini M, Rossi AM, et al. Formation of micronuclei and of clastogenic factor(s) in patients receiving therapeutic doses of iodine-131. Mutat Res 2002;514:77-85. Popova L, Hadjidekova V, Hadjieva T, Agova S, Vasilev I. Cytokinesis-block micronucleus test in patients undergoing radioiodine therapy for differentiated thyroid carcinoma. Hell J Nucl Med 2005;8:54-7. Ballardin M, Barsacchi R, Bodei L, Caraccio N, Cristofani R, Di Martino F, et al. Oxidative and genotoxic damage after radio-iodine therapy of Graves' hyperthyroidism. Int J Radiat Biol 2004;80:209-16. Kinashi Y, Sakurai Y, Masunaga S, Suzuki M, Nagata K, Ono K. Evaluation of micronucleus induction in lymphocytes of patients following boron-neutron-capture-therapy: A comparison with thyroid cancer patients treated with radioiodine. J Radiat Res 2007;48:197-204. Iarmarcovai G, Ceppi M, Botta A, Orsière T, Bonassi S. Micronuclei frequency in peripheral blood lymphocytes of cancer patients: A meta-analysis. Mutat Res 2008;659:274-83. Sundaram PS, Padma S, Sudha S, Sasikala K. Transient cytotoxicity of 131I beta radiation in hyperthyroid patients treated with radioactive iodine. Indian J Med Res 2011;133:401-6. Vrndic OB, Miloševic-Djordjevic OM, Mijatovic Teodorovic LC, Jeremic MZ, Stošic IM, Grujicic DV, et al. Correlation between micronuclei frequency in peripheral blood lymphocytes and retention of 131-I in thyroid cancer patients. Tohoku J Exp Med 2013;229:115-24. Vrndic O, Milosevic-Djordjevic O, Djurdjevic P, Jovanovic D, Mijatovic L, Jeftic I, et al. Radioiodine therapy accelerates apoptosis in peripheral blood lymphocytes of patients with differentiated thyroid cancer. Neoplasma 2013;60:568-75. Nascimento AC, Lipsztein JL, Corbo R, Rebelo AM. 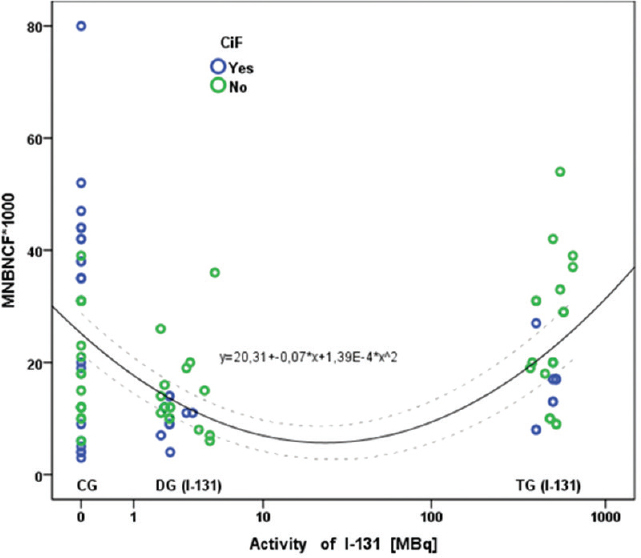 131I biokinetics and cytogenetic dose estimates in ablation treatment of thyroid carcinoma. Health Phys 2010;99:457-63. Hernández-Jardines A, Molina B, del Castillo V, Papadakis M, Rivera T, Azorín J, et al. Detection of short-term chromosomal damage due to therapeutic 131I exposure in patients with thyroid cancer. Rev Invest Clin 2010;62:31-8. Carvalho MR, Ferreira TC, Leite V. Evaluation of whole-body retention of iodine-131 ((131) I) after postoperative remnant ablation for differentiated thyroid carcinoma – Thyroxine withdrawal versus rhTSH administration: A retrospective comparison. Oncol Lett 2012;3:617-20. Jarzab B, Handkiewicz-Junak D, Roskosz J, Puch Z, Wygoda Z, Kukulska A, et al. Recombinant human TSH-aided radioiodine treatment of advanced differentiated thyroid carcinoma: A single-centre study of 54 patients. Eur J Nucl Med Mol Imaging 2003;30:1077-86. Dardano A, Ballardin M, Ferdeghini M, Lazzeri E, Traino C, Caraccio N, et al. Anticlastogenic effect of Ginkgo biloba extract in Graves' disease patients receiving radioiodine therapy. J Clin Endocrinol Metab 2007;92:4286-9. Dardano A, Ballardin M, Caraccio N, Boni G, Traino C, Mariani G, et al. The effect of Ginkgo biloba extract on genotoxic damage in patients with differentiated thyroid carcinoma receiving thyroid remnant ablation with iodine-131. Thyroid 2012;22:318-24.